Daily, 10:00 a.m. — 4:00 p.m.
Tuesday - Friday, 10:00 a.m. — 3:00 p.m.
Saturday & Sunday, 10:00 a.m. — 4:00 p.m.
Take your family on an exciting and unforgettable wildlife adventure at our open range zoo in Alvin, TX. 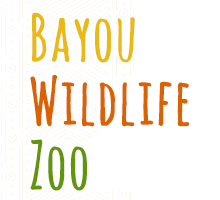 At Bayou Wildlife Zoo, you can see, pet, feed, and interact with animals from all corners of the globe as they roam freely across 80 acres of natural habitat. When you visit our zoo—one of only four in Texas—you'll get up close with our animals on a safari-like adventure before finishing with a relaxing bite in our picnic area. Don't forget to take the kids to the petting zoo or for a free pony ride. Once you're done, visit our gift shop for souvenirs to help you remember the day forever. You and your kids will love seeing all the different animals that call our zoo their home, including our amazing giraffe! Our animals come from 19 different countries, including locations in Africa, Asia, Australia, and North and South America. We add new animals periodically. For more than three decades, our owner—Clint Wolston—has been developing his private animal reserve, which he turned into a zoo open to the general public. He says: "Developing the zoo and obtaining the animals has been an exciting and educational experience. By living with the animals for the past 30 years, I've learned things not found in many books." Call to learn about our fantastic group rates. Please Note: Hours are subject to change due to weather.